The objectives of this study are twofold. First, it attempts to show the general situation and production trend of rice. Then by relating it to the current status and future potential, it proposes that reaching self-sufficiency in rice production is the paramount item on the food security agenda in this region. South Asia is world’s most densely populated region and houses the largest population of undernourished people. Despite a period of marked economic growth averaging 6% a year over the past 20 years, it remains the world’s second poorest region with more than 500 million people living on less than US$1.25 a day. Yet, there has been a considerable improvement in food security steered by the Green Revolution, use of high-yielding rice varieties, increasing investments in agriculture, improved fertilizer use and irrigation infrastructure and the potential for further increase remains high. Firstly this paper scrutinizes the role rice has been playing in the economy and food security of SouthAsia so far and that it is still the most potential means to improve the food security situation and tackle severe undernutrition as other sectors are, until now, far less furnished to address this issue. This paper probes into various economic and historical perspectives of rice economy and culture in this region, and shows that self-sufficiency in rice production is paramount to its domestic food security, and thereby proposes that emphasis should be given on increased rice production which is decelerating amid the upsurge of modern economic sectors. South Asia, which is also known as the Indian subcontinent, houses well over one fifth of the world’s population and nearly one fifth of world’s undernourished people. Despite unprecedented economic progresses in past three decades, millions of people remain food-insecure. The Green Revolution has immensely influenced various aspects of food security in India, tripling its food grain production between 1960 and 2000  and thus halving the percentages of food insecurity and poverty. According to the World Food Summit (1996), food security exists when all people, at all times, have physical and economic access to sufficient, safe and nutritious food to meet their dietary needs and food preferences for an active and healthy life. In Asia, food security has traditionally been defined as maintaining stable prices for rice in the major urban markets of a country  where it is the staple food of more than 50% of the population. For South Asia the figure is around 70% (FAOSTAT) which is highest in the world, and hence food security is essentially a reflection of rice security in this region. And thus achieving self-sufficiency in rice production is an effective way to promote national level food security. Indeed, this analysis considers the many supporting facts. Firstly, the countries in this region share significant similarities in terms of livelihood, diet, culture, lifestyle and socio-economic status and are characterized by widespread poverty, undernutrition and low literacy rate. Thus, it assumes implementation of a somewhat identical measure to face an issue as local and as global as food insecurity. Secondly, it is a developing region and the economy is chiefly agrarian. No other sector of the economy is likely to bring a sustainable level of food security for the fast growing population as effectively as the rice industry is doing at present. Last but not least, natural disasters, political corruption, malgovernance and transnational crime are rife in South Asia and continue to cripple development issues and opportunities. No significant interventions are possible in such cases to ameliorate the condition of food security, irrespective of production status. This study focuses on five South Asian countries including India, Nepal, Bangladesh, Sri Lanka and Pakistan and main data sources are from their ministries of agriculture. Other sources include the World Bank, FAO Agricultural Statistics, WHO, Bangladesh Bureau of Statistics (BBS), International Rice Research Institute (IRRI), International Food Policy Research Institute (IFPRI), Bangladesh Rice Research Institute (BRRI), Global Agricultural Information Network (GAIN), National Center for Agricultural Economics and Policy Research (NCAP), Bangladesh Agricultural Research Council, Consultative Group on International Agricultural Research (CGIAR), United States Department of Agriculture (USDA) and various conference and research papers. The reason why India and Bangladesh appear more frequently in the analysis is mainly because they rank among top five global producers and the two largest producers and consumers of rice in South Asia, and also because their rice consumption plays a vital role in the rice economy of South Asia and the whole world. In rice production, South Asia has made a quantum leap since the spread of the Green Revolution. With 41% arable land, it is currently the second largest rice producing region in the world . In 2010/2011 it produced 139.7 million tons of rice which is the second highest on record to date . India has become the world’s second largest rice producing nation with the largest rice harvesting area in the world . Rice occupies about 24% of total cropped area of the country and contributes 42% of total food grain production and 45% of total cereal production. Around 65% of the total population in India depends on rice and it accounts for 40% of their food production . Bangladesh, being the third largest economy in South Asia, is the world’s sixth largest rice producer . In 2000 to 2001, rice alone occupied 75% of the cultivable land  in Bangladesh which increased to 79.4% in 2008 . In 2011, Bangladesh produced an all time record of 34.25 million tons of rice . Rice also accounts for 94% of the cereals consumed and constitutes 92% of the annual food grain production . According to data from the last 40 years, the per capita rice consumption rate in Bangladesh is 153.02 Kg per person per year. In Pakistan, wheat is the staple food yet they are the world’s fourth largest producer of rice. Paddy rice production in Sri Lanka for 2011/2012 recorded an all time high of 4.869 million metric tons . Sri Lanka currently produces 2.7 million tons of rough rice per year which supplies 95% of the domestic requirement. South Asia imported 1.84 million tons of rice in 2011, with Bangladesh the largest buyer . Only India and Pakistan are self-sufficient in rice production; Sri Lanka, Bangladesh and Nepal are not yet self-sufficient and depend on exports from other countries (Figures 1 and 2). Shows that India is the major exporter of rice in South Asia selling about 98 million tons in 2012. Pakistan is the only other exporting country but the volume is much lower compared to India. Source: United States Department of Agriculture . 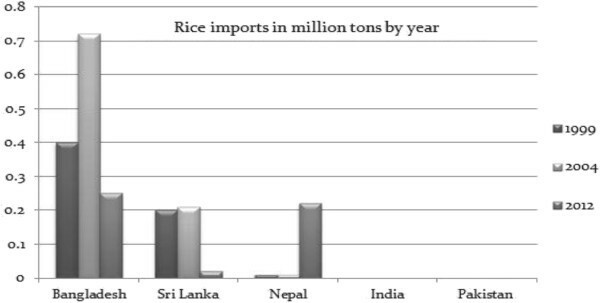 Shows the trend of rice import by Bangladesh, Nepal and Sri Lanka. 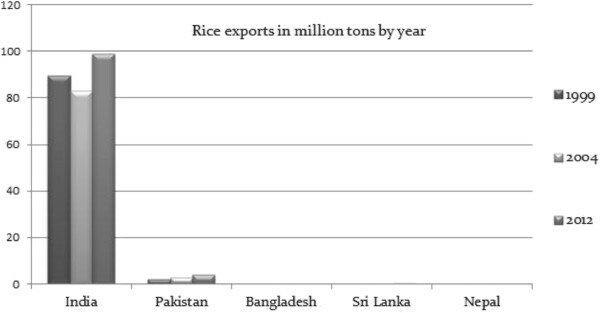 Bangladesh is highly dependent on import from others countries and the biggest importer of rice in South Asia. India and Pakistan are the only two self-sufficient countries in rice in the region. Source: United States Department of Agriculture . Agriculture has historically been a dominant sector in South Asian economy, employing about 60% of the labor force and contributing 22% of the regional GDP . 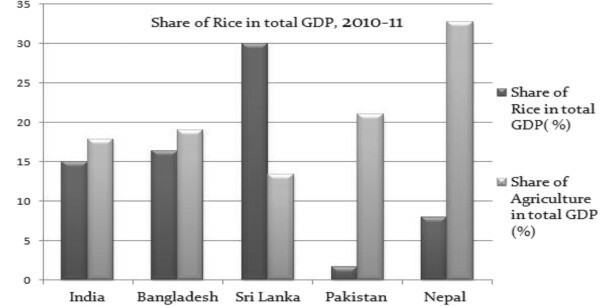 Figure 3 shows share of rice in total GDP for 2010/2011. In 2000/2001, the agricultural GDP share of the total GDP of Bangladesh at the current price was 30%  and rice alone occupied 75% of the cultivable land  whichbecame 79.4% in 2008 . In Nepal, agriculture remains the principal economic activity, employing 66% of the population and providing 39% of GDP . In 2007, rice alone accounted for 87.5% of the agriculture share of its total GDP . Sri Lanka’s rice sector contributes 30% to the agricultural GDP . Rice is the single most important crop occupying 34% (0.77 /million hectares) of the total cultivated area in Sri Lanka. In 2003, India and Bangladesh together contributed 28% (22 and 6 respectively) of global rice production and 33.57% in 2009 (26 and 7.5 respectively). However, the share of rice in total agricultural output (Figure 4) and total GDP has been declining. In 1961, rice accounted for 8.4% of GDP in South Asia, declined to 2.7% in 2007. Shows the percentage share of agriculture in total GDP beside the percentage share of rice in total GDP in 2010/2011. Pakistan’s agricultural share in total GDP is higher than that of India and Bangladesh but contribution of rice to total GDP remains much lower. Rice contributes the lions share in GDP for Sri Lanka, while India and Bangladesh show a similar pattern of dependency on rice. For Nepal, agriculture has the biggest share in total GDP comparing to the other four countries but shows that contribution of rice to GDP is comparatively lower. Source: [18–21]. Shows the percentage share of rice in total agricultural output in three different regions of the world. Share of rice is on the decline since 1980 butit is still the chief agricultural product in Southeast and South Asia. There is no direct answer to this question. However, the response provokes a counter-question; what else is there to substitute rice? The answer is simple- nothing. Rice is the cheapest and most effective means available in this region that is likely to eradicate acute undernutrition. Many studies have revealed that there is a great potential to increase the rice production in South Asia. India, Bangladesh and Sri Lanka are among the most disaster-prone countries in the world. Recurrent floods, cyclones, earthquakes, landslides and droughts hugely affect the production in these countries. Still they have maintained a steady growth for the last three decades (Figure 5). And now with the advent of modern breeding strategies, which has proved to be much more efficient than conventional techniques, and environmental stress-tolerant varieties, the whole scenario for rice production appears better than ever. Shows that Bangladesh has been the highest rice yielding nation since 1991 in South Asia. All the countries except India have shown an increasing yield since 2001 while Bangladesh has undergone a sharp decline. Source: United States Department of Agriculture . Rice provides around 60 to 70% of calories and 50 to 55% of protein intake in the South Asian population. Many micronutrient supplementation projects have been carried out, but to no avail. Inadequate calorie intake hampers proper micronutrient metabolism. Though dependence on rice on the scale seen in South Asia is nutritionally undesirable, it is also true that rice is still the most affordable way for these people to maintain a sustainable calorie intake. The Indian subcontinent has a tradition which is inseparably mingled with rice, is more than mere livelihood and has shaped the history, culture, art, and lifestyle of its population in many ways. It is regarded as a sign of fortune and well-being in many South Asian societies. In weddings, seasonal festivals, and rituals, rice plays an inevitable part. The amount of rice consumed in this region explains how important rice is in their lives (Table 1). The so-called dal-vat-tarkari is an iconic menu seen across the entire Indian subcontinent. Vat (cooked rice) is the term for meal in many South Asian languages. In Hindu rituals, paddy is an indispensible item. Two panicles of paddy appear on many logos, monograms and bank notes in Bangladesh. Table 1 shows that in terms of per capita consumption, Bangladesh is the largest consumer of rice in South Asia which explains why it depends on exports every year despite having the highest production rate. Nepal and Sri Lanka show a similar rice-eating habit. India, being the largest exporter is the fourth largest rice consuming nation in South Asia. Pakistan is the country least dependent on rice as wheat is the staple food for most of its population. Source: adapted from FAOSTAT database . The population in South Asia is predicted to exceed six billion by the end of the century and may face a severe food shortage unless production can keep pace with the increased demand. Also, there are many crucial problems including water scarcity, decreasing size of agricultural land, inadequacy of agrochemicals, power shortage and poor infrastructure. Yet there is a ray of hope shed on the future of rice by biotechnology which ensures greater productivity. Additionally, subcontinental soil is suitable for rice and production per unit of land is considerable. 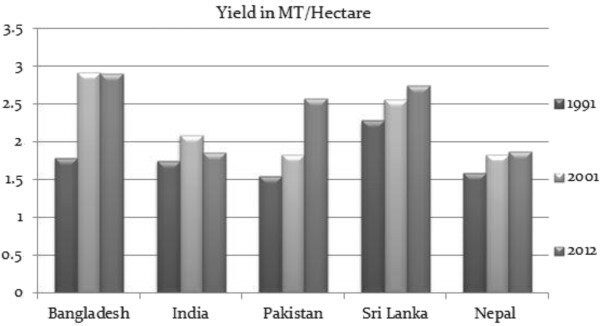 Figure 5 shows that there is an increasing trend in average yield of rice in Pakistan, Nepal and Sri Lanka while India and Bangladesh have undergone a sharp decline. However, the demand for food is only rising and is being met by constantly diminishing resources. To boost production, increasing amounts of fertilizer and pesticide are being used and aggravating environmental and ecological problems. Thus the need for a sustainable intervention to these urgencies necessitates innovation in rice technology and development of varieties which are not only high yielding but also can be produced in more eco-friendly ways. The development of high yielding varieties(HYVs) and bio-fortified, disease-, insect-, flood-, drought-, saline-, herbicide- and stress-resistant rice has opened a new era in the history of rice and will boost rice production in near future. Genetic engineering has offered rice cultivars resistant to herbicide, salinity and drought. Malnutrition, being a widespread problem in this region, requires an immediate intervention which may be very effectively addressed by bio-fortified rice. Rice bio-fortified with iron and zinc can protect against certain deficiency diseases and people who have no access to commercially marketed fortified foods and supplements will greatly benefit from it. Golden rice, which is a genetically modified strain of rice and enriched with beta-carotene, has the potential to save millions of children from blindness and other deadly consequences of acute vitamin A deficiency. More and more biotechnologists around the world are working to develop such micronutrient-rich rice varieties which were not possible by conventional breeding technologies. Field trials are also being undertaken to estimate any potential health impacts of the newly innovated rice cultivars. Gene banks have a major role to play in preserving the native cultivars and the artificially designed ones. From a food security perspective, gene banks are invaluable as they provide all the past cultivar options and if a variety fails to due to certain causes, farmers still can turn to gene banks for the varieties that were previously available. Food security is a multifaceted issue influenced by national and international policy making; social, economic, environmental and demographic variables being the most prominent ones. Rice is not only the staple crop of South Asia, it is also a political crop. Large rice stocks are maintained by many countries and remain untraded until market prices rise abnormally high, and consequently food scarcity remains a common scenario across many poor areas. Though SAARC countries have launched the South Asia Food Security Program, there is still a lot to be done. Lack of mutual cooperation has long debilitated the region’s socioeconomic development. Shockingly, in terms of regional trade, South Asia is the world’s least integrated territory, trade between the countries accounting for less than two percent of the gross domestic production (GDP) of the region. Promoting regional cooperation and integration with neighboring organizations like ASEAN can prove to be phenomenal in alleviating poverty and achieving food security. Cross-border trading, mutual work on scientific and technological research, and improved communication will greatly facilitate the region’s political, economic, and social welfare and would enable the countries to mitigate against food crisis and other related issues more effectively. It is therefore of utmost importance to strengthen regional cooperation and build ties across political borders to increase trade and improve regional food security. From this study it is apprehensible that sustained production of rice is central to food security in South Asia. Subcontinental land is quite capable of being self-sufficient in rice production and India and Pakistan have already proved that. Since poverty is another direct cause of food insecurity, people can move out of stark poverty if they can be employed in agricultural activities and many such projects are already in operation in many countries. From the present South Asian perspective, there is no other easier way to promote national food security than through gaining self-sufficiency in rice production. Raising agricultural production is evidently the most direct way to tackle food insecurity in agronomic countries and agronomy is essentially rice economy in South Asia. The fact that most of the poor and undernourished people of South Asia are living in rural areas, and that they are largely dependent on agriculture for their livelihood can be a problem and a solution at the same time. Since agriculture is the mainstay of its economy, and the ratio of rice land to arable land is high in the subcontinent, there remains an opportunity to expand domestic rice production by creating employment and income generating opportunities in the face of ever increasing demand for rice. If self-sufficiency is achieved, it will create scope for surplus production. Also, having a surplus of rice will allow rural people to profit and can lift them above the poverty line. In a strict sense, income generation and food security initiatives go hand-in-hand and this reality makes rice more important to food security in South Asia. This paper thus substantiates that agriculture is the backbone to the South Asian economy and that rice, being the staple agricultural product, holds the capacity to pull people out of stark poverty and ensure sustainable availability of food for the food-insecure population. This study could not have been possible without the unconditional help of many of our colleagues who helped to gather data and gave valuable suggestions. Special thanks is given to Mr. Arun Kumar Mondal for his generous contribution in conducting this research and help in revising the manuscript. GB conceived the study idea; DY, SS, MAK, HG have helped in collecting data and drafting the manuscript. MLJ, DY and SG revised it critically for important intellectual content. All authors read and approved the final manuscript. LGL and GB had primary responsibility for final content.